This article from the Visiola Foundation is the first in the United Nations Academic Impact (UNAI) Women in Science, Technology and Innovation series that analyses the gender dimension of Sustainable Development Goal #9: Industry, Infrastructure and Innovation. Leading women inventors of the 21st century were asked to avail themselves for interviews and submit articles highlighting the gender dimension of their work, research or inventions as they relate to SDG #9 and outlining their implications in helping to realize that goal. Please note that the interviews and articles are for discussion, and do not necessarily reflect the views of the United Nations . African countries collectively spend US$4 billion a year hiring Science, Technology, Engineering and Math (STEM) expatriates. This is largely driven by the limited number of African STEM professionals in the region. However, the irony is that there are actually more African scientists and engineers working in the USA than there are on the continent. A cursory glance at the available literature and research done by regional and international scholars in the past decade highlight the weak educational system, ineffective policy frameworks, and limited spending on Research and Development (R & D) as some of the reasons behind this perplexing state of affairs. Even when students train to become science researchers, for instance, the lack of funding and supporting infrastructure serve as a disincentive and results in many of them seeking employment in foreign jurisdictions. Unsurprisingly, there are only 79 scientists per million Africans, compared with 4,500 per million Americans. Although Africa’s billion-person strong population accounts for 15% of the global population, the region only contributes 1% of global scientific knowledge and ranks in the bottom percentile of the 2014 Global Innovation Index. These statistics are startling. By 2050, a quarter of the world’s working age population will be African and by 2100, half of the world’s youth will be African. But this human capital is not being sufficiently skilled to create or access rewarding jobs and fulfilling careers. As I have noted previously, left unchecked, this worrisome trend could lead to deeper social and economic pressures on the already stressed global economy. African countries would therefore be best served by investing in building their capabilities to strengthen economic diversification and gain a comparative advantage in the key sectors that will drive job growth and income generation. In this way, they will effectively translate the youth bulge into a regional dividend that simultaneously cuts unemployment rates, develops and retains local talent, while catapulting the continent into the industrial frontier. Ultimately, the continent needs to invest in developing the local skills that will enable it to become a producer of knowledge, technology, and innovation, instead of merely being a consumer. As such, the Visiola Foundation: (i) awards full, merit-based academic scholarships to high potential girls from disadvantaged backgrounds to pursue STEM degrees at African universities; (ii) runs high-quality after-school STEM Clubs for girls attending public schools, to build their confidence in studying STEM subjects, while stimulating their intellectual curiosity; (iii) runs Coding Boot Camps for Girls to teach them how to code, think critically, and leverage technology to solve problems; and (iv) runs STEM Camps for Girls to pique their interest and expose them to the numerous opportunities provided by STEM. The Foundation additionally ensures that students are mentored by African and international STEM professionals to support their academic and career pursuits. Our ultimate goal is to significantly boost the availability of leading STEM professionals in Africa by building a pipeline of female scientists, engineers, and innovators. Through our work we address the prevailing gender stereotypes and cultural norms and mores that often limit the aspirations of girls and women. We emphasize the fact that talent is gender neutral and that African women have the potential to contribute positively to industry, business, and to society at large. Through our programs, students have learned how to translate simple science theories into practical solutions to basic challenges. For instance, they learned how to use scrap materials to build an eco-friendly air conditioner that could improve the lives of people in rural areas who lack access to electricity. They have also learned how to build simple robots that could be used for a variety of purposes, including improving healthcare delivery and streamlining manufacturing. They have additionally learned how to create 2-D computer animations to strengthen the dissemination of critical information in underserved areas. We are teaching them to think outside the box and to approach life through the analytical lens of the STEM subjects. In August 2016, some of our students were invited to a special roundtable meeting with the U.S. Secretary of State, John Kerry, where they impressed him with the robotic forklift and salt-water alarm that they had built. Our scholarship recipients continue to excel in their academics with an average Cumulative Grade Point Average (CGPA) of 4.8/5.0, while implementing community projects using their STEM skills. Our work is important and directly contributes to the attainment of the SDGs because our students are the future innovators who will devise innovative and more efficient means for building robust infrastructure in the region. They will lead scientific breakthroughs and will develop new drugs and cures to the diseases and illnesses that continue to devastate Africa. They will create machines and processes that will enable African producers to move up the agricultural value chain through beneficiation. 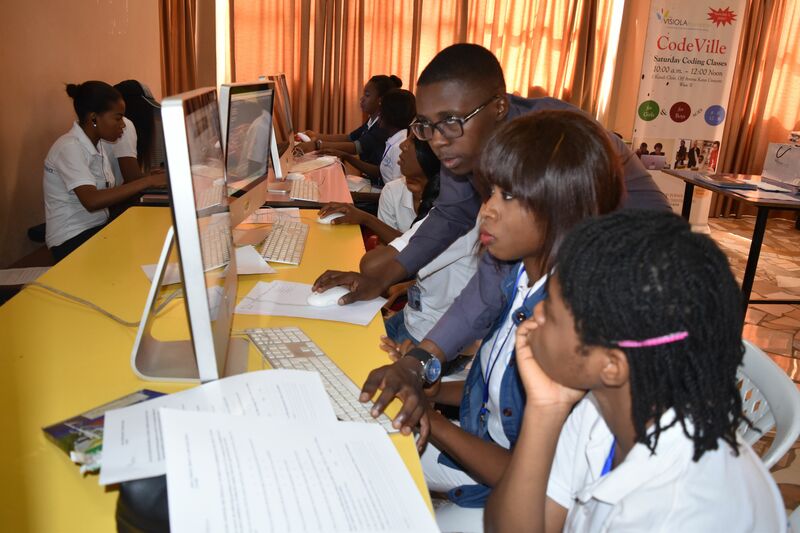 They are future STEM leaders and innovators who will drive industrialization on the continent. In closing, the SDGs are especially significant since, unlike the Millennium Development Goals (MDGs), they provide a global and universal set of targets to make the world a better place – for everyone; not just developing countries. The Visiola Foundation is especially pleased to note that the SDGs place particular emphasis on: (i) promoting equal access to quality technical, vocational, and university education to marginalized people, while expanding access to scholarships for study in the STEM fields; (ii) promoting the use of enabling technology to empower women; and (iii) enhancing scientific research, technical capabilities, and domestic technology development, while stimulating innovation, greater investment in R & D, and industrialization. These are well-aligned with our mission and targeted programs.